Suddenly there is tension in the National Institute of Technology campus in Srinagar, Jammu and Kashmir. Per news reports Kashmiri students were celebrating India’s T20 loss to West Indies, arguably a cause for provocation. In response to this as also to anti-national protests by a minority of students in JNU, Hyderabad University and Jadavpur University, non-local students (e.g. 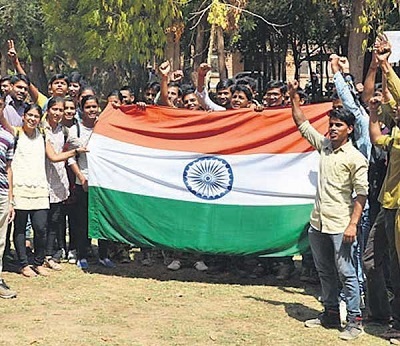 Jammu and other regions) gathered and raised pro-India slogans and raised the national flag, but looks like they have been beaten by police (the matter is under investigation) and these students feel their lives are threatened. What is the problem with raising the tricolor or the national flag? How come the JNU protesters – Kanhaiya Kumar and Shehla Rashid gone into silence mode?